The 1930s decade (and most of the 1940s as well) has been nostalgically labeled "The Golden Age of Hollywood" (although most of the output of the decade was black-and-white). 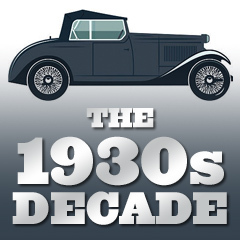 The 30s was also the decade of the sound and color revolutions and the advance of the 'talkies', and the further development of film genres (gangster films, musicals, newspaper-reporting films, historical biopics, social-realism films, lighthearted screwball comedies, westerns and horror to name a few). It was the era in which the silent period ended, with many silent film stars not making the transition to sound (e.g., Vilmy Banky, John Gilbert, and Norma Talmadge). By 1933, the economic effects of the Depression were being strongly felt, especially in decreased movie theatre attendance. 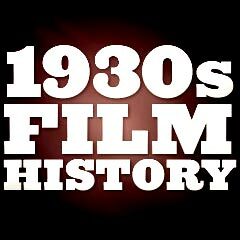 Although Austrian-born director Josef von Sternberg's best works were in his silent films (Underworld (1927), The Last Command (1928), and The Docks of New York (1929)), he acheived greatest notoriety during the 30s. Exotic German actress Marlene Dietrich's stardom was launched by von Sternberg's The Blue Angel (Germany, 1929) with her role as the leggy Lola Lola, a sensual cabaret striptease dancer and the singing of Falling in Love Again. It was Germany's first all-talking picture. Dietrich would soon go on to star in many other films - usually with characters that were variations on Lola - jaded femme fatales. Dietrich was 'discovered' and appeared in her first Hollywood feature film, Morocco (1930), again as a nightclub singer with co-star Gary Cooper as a French legionnaire. Dietrich was subsequently promoted by Paramount Studios as a 'continental' German rival to MGM's imported star Greta Garbo. A few years later, Dietrich collaborated further with von Sternberg in Dishonored (1931), Shanghai Express (1932), Blonde Venus (1932) (with Dietrich as a demure wife who is transformed into a cabaret star), The Scarlet Empress (1934) (with Dietrich as Russia's Catherine the Great), and in The Devil is a Woman (1935) (as a money-hungry, seductive vamp). Dietrich and von Sternberg made a total of seven films together. By 1946, von Sternberg was the uncredited assistant to director King Vidor for Duel in the Sun (1946). Most of the early talkies were successful at the box-office, but many of them were of poor quality - dialogue-dominated play adaptations, with stilted acting (from inexperienced performers) and an unmoving camera or microphone. Screenwriters were required to place more emphasis on characters in their scripts, and title-card writers became unemployed. The first musicals were only literal transcriptions of Broadway shows taken to the screen. Nonetheless, a tremendous variety of films were produced with a wit, style, skill, and elegance that has never been equalled - before or since. Rouben Mamoulian, a successful Broadway director, refused to keep the cumbersome sound cameras pinned to the studio floor, and demonstrated a graceful, rhythmic, fluid, choreographed flowing style in his films - first with his directorial debut 1929 film Applause (1929) (and later with Love Me Tonight (1932)), one of the first great American musicals starring legendary Roaring 20s torch singer Helen Morgan in her first film role. Applause also introduced a revolutionary sound technique: a double-channel soundtrack with overlapping dialogue. Mastery of techniques for the sound era were also demonstrated in the works of director Ernst Lubitsch, who advanced the action of his films with the integrated musical numbers. The first filmic musical was Lubitsch's first talkie, the witty and bubbly The Love Parade (1929/30) with Jeanette MacDonald (in her debut film) and Maurice Chevalier (in his second picture) - the recipient of six Academy Awards nominations (including Best Picture, Best Director, and Best Actor). After directing three more musical comedies in the next three years, including Best Picture-nominated One Hour with You (1931/32) with the same leads, Lubitsch filmed his last musical, The Merry Widow (1934) with equally naturalistic musical expressions and the winner of the Best Art Direction Academy Award. Also, in the first filming of the Ben Hecht-MacArthur play, Lewis Milestone's The Front Page (1931), a mobile camera was combined with inventive, rapid-fire dialogue and quick-editing. Other 1931 films in the emerging 'newspaper' genre included Mervyn LeRoy's social issues film about the tabloid press entitled Five Star Final (1931) (with Edward G. Robinson and Boris Karloff in a rare, non-monster role), Frank Capra's Platinum Blonde (1931) (with Jean Harlow), and John Cromwell's Scandal Sheet (1931). After 1932, the development of sound-mixing freed films from the limitations of recording on sets and locations. Scripts from writers were becoming more advanced with witty dialogue, realistic characters and plots. Hecht adapted Noel Coward's work for Lubitsch's Design for Living (1933), starring Gary Cooper, Fredric March and Miriam Hopkins, and Dudley Nichols adapted Maxwell Anderson's play for director John Ford's screen version Mary of Scotland (1936). One of the first 'color' films was Thomas Edison's hand-tinted short Annabell's Butterfly Dance. Two-color (red and green) feature films were the first color films produced, including the first two-color feature film The Toll of the Sea, and then better-known films such as Stage Struck (1925) and The Black Pirate (1926). It would take the development of a new three-color camera, in 1932, to usher in true full-color Technicolor. The first film (a short) in three-color Technicolor was Walt Disney's animated talkie Flowers and Trees (1932) in the Silly Symphony series. [However, others claim that the first-ever color cartoon was Ted Eschbaugh's bizarre Goofy Goat Antics (1931).] In the next year, Disney also released the colorful animation - The Three Little Pigs (1933). Its optimistic hit theme song: "Who's Afraid of the Big Bad Wolf?" (based upon the tune of Happy Birthday) became a Depression-era anthem. It was one of the earliest films displaying 'personality animation' - each of the three pigs had a distinctive personality. In 1934, the first full-color, live-action short was released - La Cucaracha (1934). Hollywood's first full-length feature film photographed entirely in three-strip Technicolor was Rouben Mamoulian's Becky Sharp (1935) - an adaptation of English novelist William Makepeace Thackeray's Napoleonic-era novel Vanity Fair. The first musical in full-color Technicolor was Dancing Pirate (1936). And the first outdoor drama filmed in full-color was The Trail of the Lonesome Pine (1936). In the late 30s, two beloved films, The Wizard of Oz (1939) and Gone with the Wind (1939), were expensively produced with Technicolor - what would the Wizard of Oz (with ruby slippers and a yellow brick road) be without color? And the trend would continue into the next decade in classic MGM musicals such as Meet Me in St. Louis (1944) and Easter Parade (1948). Special-effects processes were advanced by the late 1930s, making it possible for many more films to be shot on sets rather than on-location (e.g., The Hurricane (1937) and Captains Courageous (1937).) In 1937, the Disney-produced Snow White and the Seven Dwarfs (1937) was the first feature-length animated film - a milestone. The colorful Grimm fairy tale was premiered by Walt Disney Studios - becoming fast known for pioneering sophisticated animation.